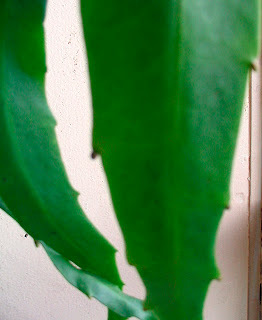 Pretty Lady: Breaking News: The Epiphylum is Going to Bloom!!! As Pretty Lady's intimates are well aware, her epiphylum has long been a source of both joy and consternation in her personal life. At various times it has come to a pitched battle of wills between the two of them. 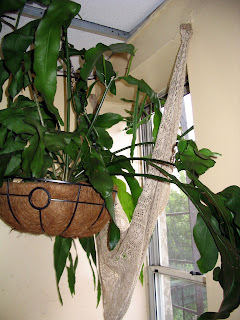 In recent months, Pretty Lady has taken a very hard line with this overweening plant; she has rigorously withheld fertilizer, watered infrequently, and viciously pruned its tentacular invasions, which threatened to penetrate the attic. One notes that the infelicitous architecture of a Brooklyn kitchen window has produced an asymmetrical slump, despite seasonal rotations; some of the rear leaves have become wizened and despondent. But all of this abuse has evidently borne fruit, or at least flower buds. Upon examining a leaf this morning, Pretty Lady noticed a tiny but unmistakeable lump, which bears no resemblance at all to just-another-damn-leaf-bud. Further perusal of the situation revealed that practically the whole sunny-side cascade was silly with miniature floral extrusions. They are currently so small as to resist photographic depiction, but Pretty Lady will keep you all posted regarding their progress. Isn't that something, that such plants need a bit of stress and difficult circumstances to bear fruit? People are often like that too. How wonderful! That's such an exciting moment, when you first see the signs of flowering on a special plant. Bleah. The buds are shriveling up and falling off. I am Cynical and Depressed.